Enchanted Village – TowersStreet - Your premier Alton Towers guide! Nestled deep within a mystical woodland, make your stay at the resort more magical by discovering the Enchanted Village. Whether you’re staying in one of their Woodland Lodges or treating yourself to a Luxury Treehouse, you’re sure to have an absolutely magical time as the Fable Folk welcome you to the land where the work, rest and play! The Enchanted Village can be found a stone’s throw away from Alton Towers Hotel, transporting guests into the mythical world of the Fable Folk, who have ventured out from their woodland home to create a stayover experience not quite like any other found at the Resort. Accommodation in the Enchanted Village is split into two type but whether your are staying in the Woodland Lodges or the Luxury Treehouses guests are welcome to use all of the resort’s facilities. Scattered throughout the lodges can be found a number of different play areas to keep younger guests entertained. 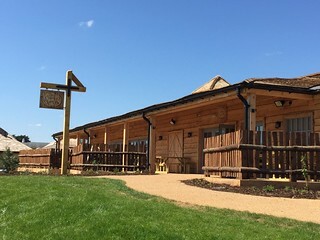 At the heart of the village can be found The Crooked Spoon restaurant, alongside the Enchanted Village Welcome Desk, where guests can check in to the Woodland Lodges (guests staying in the Treehouses should check in at the Alton Towers Hotel). Nearby can also be found the Enchanted Village Store, which is packed full of souvenirs as well as those last minute essentials. A short distance away can be found the Enchanted Forest’s Tree Top Quest, where guests can take to the skies on this aerial rope-way. The entrance to the course can be found near the village’s Enchanted Car Park. For less daredevil guests the Enchanted Village is also conveniently located for a trip to the nearby Alton Towers Spa though all of the resort’s facilities are available with a short walk. Be aware when booking your rooms that, unless explicitly stated, only bed and breakfast is included in the price of the stay. Alton Towers Theme Park, Cariba Creek Waterpark, Tree Top Quest and Extraordinary Golf all incur extra charges, which can be added at the time of booking or during your stay. There are various packages available when booking, so take the time to check out your options. Most of the village is made up of Woodland Lodges. Each of the cottages in the village contains two lodges, which combines all of the connivance of a modern hotel room with the magic touch brought by the Fable Folk of the village. For an extra special stay in the Enchanted Village you could choose one of the five luxury treehouses beyond the grassy knoll at the edge of the village. Each of the treehouses is unique and are full of hidden nooks and crannys to discover during your stay. With four bedrooms each (sleeping upto 8), as well as a living room and small kitchen, the treehouses are sure to feel like a home away from home. On top of all the home comforts you might need the treehouses are also complete with plenty of life’s luxuries, such as the bubbly hot-tub to unwind in after a day exploring the resort. They say that at the heart of every community there is a hearth with a bubbling pot, well in the Enchanted Village that hearth can be found at The Crooked Spoon. Serving up a range of rustic dishes, this homely restaurant is an ideal spot to relax after a hard day of play around the resort. For the village’s construction archive please click here.